Trip Fixed Stating Dates extension allows travel agencies and tour operators to show trip fixed starting dates and number of space available for booking. Trip Fixed Stating Dates requires WP Travel Engine plugin installed. The setting area allows you to control how to display the dates. You can enable or disable to show the trip starting dates on a single trip/tour page. You can change the label of the title of trip starting dates from here. First, find in the admin area the trip that you want to edit. Edit the product and scroll down. 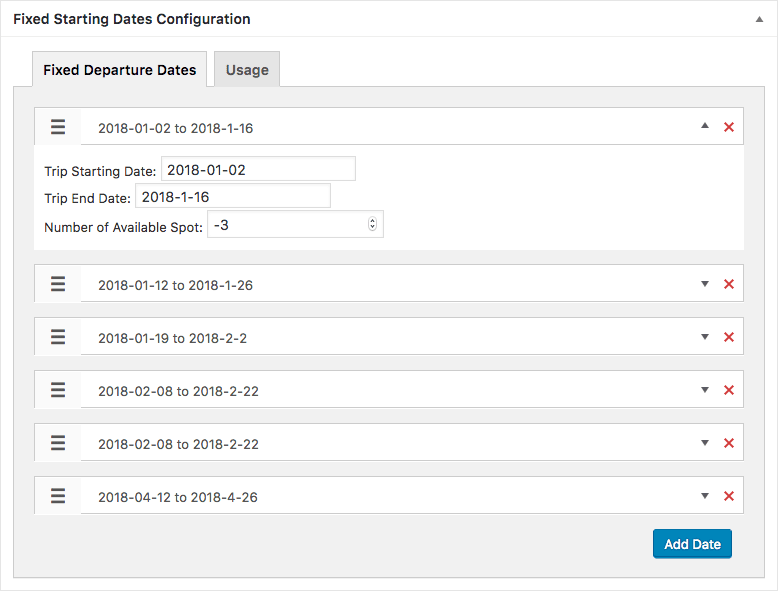 You will see a meta box titled “Trip Fixed Starting Dates Configuration”. It has two tabs named Fixed Starting Dates and Usage. To add a fixed starting date, click on “Add Date”. Select a trip starting date. The end date of the trip is automatically displayed based on the duration of the trip. Enter the number of space or seat available. To add another starting date, click on “Add Date” again and repeat the process. By default, the trip starting dates are between the featured image/slider and description. If you want to hide the starting dates from this section on this trip, then you can enable “Hide Fixed Trip Starting Dates Section”. If you want to show the dates in a different location, you can use the shortcode. Using the PHP function, you can display the dates on a location throughout all the trips.